Sometimes you want more than just Tent Stitch for your background. But you find yourself faced once again with not having enough thread in a single dyelot. That’s where I got the idea of creating stripes. If you just stitch with one dyelot until you run out then switch, it’s pretty clear that you ran out of thread. But if you create a background with a stitch that makes stripes and vary the dyelot in a regular way — surprise! Your background has texture from the stitch and pattern from the regular change in dyelot. I did just that in this canvas, a limited edition piece from Amanda Lawford. You may think that if you need stripes, you’re limited to versions of Gobelin Stitch. In fact there are many stitches that create stripes with even edges. Some stitches, such as corduroy, below, are Gobelin variations. Some stitches, such as Diaper, below and used in model, are columns or rows of box stitches. Some stitches form rows because the halves of the stitch fit together, such as Diagonal Beatty, below. Even a very complex stitch, such as Mixed Milanese, below, can be a stripe. To find candidates for stripes, look for stitches that have flat edges on both sides and run along straight lines. These stitches should form “ditches” between rows. That makes stitches such as Byzantine not suitable for this technique. Stripes used for the background can be either horizontal or vertical. Pick the direction of your stripe based on the focal point. Although most backgrounds have enough repeats that centering isn’t necessary, it helps if your stripe fits evenly into the background. To pick a stripe that fits, count the number of threads in your background and divide it by the width of the stitch — if it divides evenly the stitch fits. If there is a remainder — find another stitch. If your stripe is two threads wide, you can tell if it will fit just by looking. Run your finger along one thread of the background. If the same intersection type of intersection is on both ends, there is an odd number of threads and this stitch won’t fit. 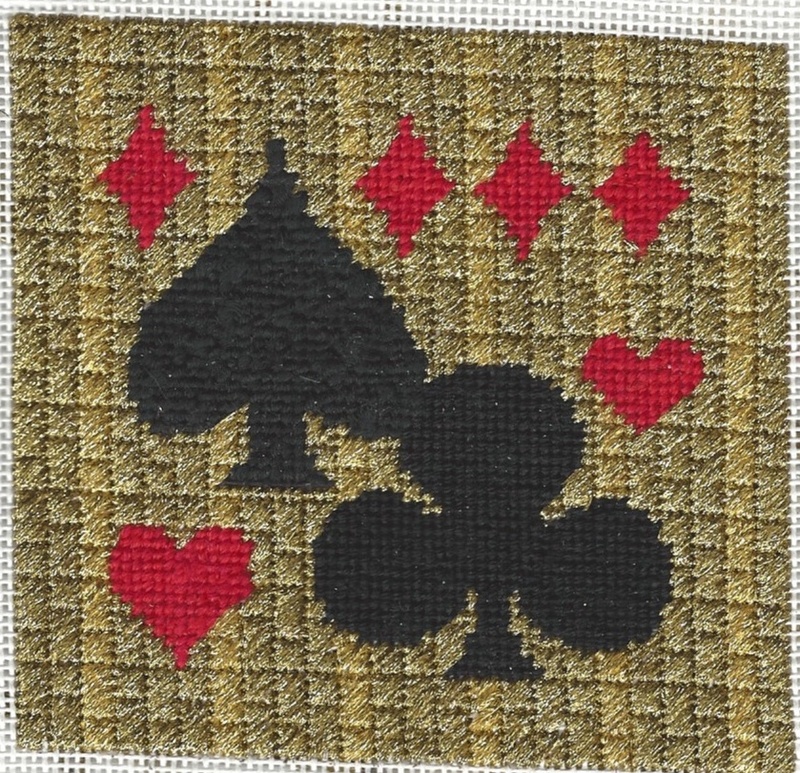 If the type of intersections is different, there are an even number of threads in the piece and the stitch will fit. For all non-50/50 stripes, it’s best to center. Find the center of your background and place the center of your stripe pattern, whether stitch or ditch here. Then stitch the pattern to each side. Often you’ll find that you have more of one dyelot than the other. That was the case here. I had one card of the lighter gold and three of the darker. When this happens you’ll find it doesn’t make sense to alternate stripe by stripe; you may still run out (I did on my Jack o’Lantern face). Instead use the proportions of threads you have to create a stripe. Here I used three stripes of dark and one of light. I was able to finish the piece without running out of the lighter thread.